With the election less than three weeks away and the outcome possibly against them, the Goodluck Jonathan Presidency and the hardliners in the PDP have embarked on a new strategy to put brake on the momentum APC presidential candidate Muhammadu Buhari seems to be gathering. Bola Tinubu Ynaija This strategy is novel and seems to be the outcome of a desperate calculation in that the PDP has shifted its attention from the APC in order to attack on multiple fronts the former governor of Lagos state and APC national leader, Bola Tinubu. From what can be gathered through informed sources, the PDP and Jonathan Presidency had recently tried to fracture the APC by offering Tinubu the position of vice President in an interim government if he would agree to part company with the popular Buhari. Five days to the first anniversary of his administration, governor of Anambra State, Chief Willie Obiano has continued to attract investments into the state with the signing of a $1.5 million dollars agreement with an American healthcare firm, Rise Health Corporation, USA. Mothering Sunday celebrated in countries around the world as Mother’s Day is fast approaching; We know that there is no gift that can fully appreciate the gem that is your mother but there are sure ways to make her feel special! Kaymu has handpicked 5 choice gifts for the special woman in your life this mother’s day. 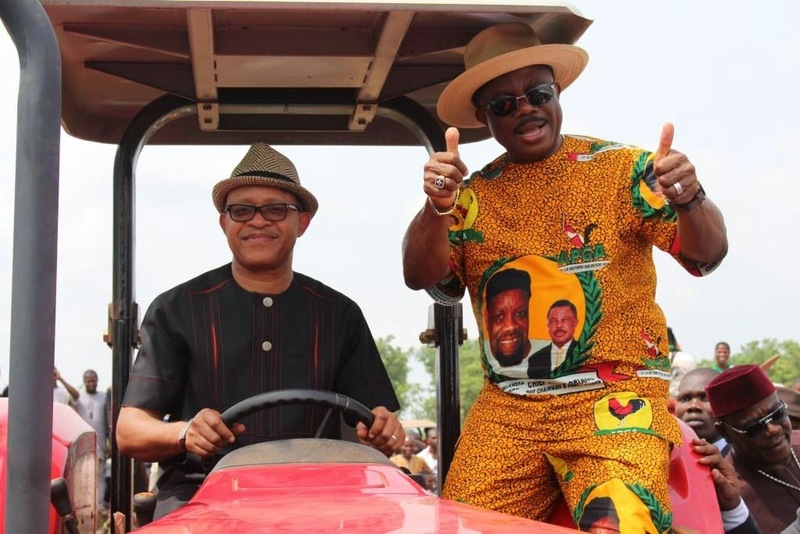 Flagging off the N16 billion ($100m) farm which will exclusively focus on the cultivation and processing of tomato and cassava, Wednesday, Governor Obiano announced that finally, the fire of his administration’s agrarian revolution has started to spread. Efforts towards building a self-reliant and gainfully employed citizenry in support of the programmes of the Anambra state government is fast yielding results as the skills acquisition and empowerment programmes initiated by the wife of the governor of Anambra state, Chief (Mrs.) Ebelechukwu Obiano, Tuesday graduated 63 students in Beauty Therapy and Hairdressing at the Mary Sumner Vocational Institute, the Vocational training centre of Pauls University Awka. Igbokenyi community in Anambra West LGA, Monday appealed to the PDP Senatorial Candidate for Anambra North Zone, Princess Stella Oduah, for access road, potable water, hospital, school and power supply. The Vicar of St. Mary’s Anglican Church, Igbokenyi, Rev. Victor Ogbalu, made the appeal when Oduah, former Minister of Aviation and her senatorial campaign team paid a visit to the community. It took Oduah and her campaign team three hours on a speed boat from Onitsha axis of the River Niger to locate the community, which is cut-off from the rest of Anambra State. Former Head of State, Gen. Abdusalami Abubakar, on Tuesday urged Nigerians to give President Goodluck Jonathan the benefit of doubt on his promise that general elections would hold as re-scheduled. Abubakar made the call while fielding questions from newsmen in Kano. The former Head of State was in Kano to inaugurate the Kano Informatics Institute, Kura. He said Jonathan had in the recent Presidential Media Chart promised to allow the Independent National Electoral Commission (INEC) to conduct the polls on the new dates. “As our President, let us give him benefit of doubt and accept what he said,” Abubakar said. He, however, urged INEC to ensure the conduct of free, fair and acceptable elections for the sustenance of the country’s democracy. According to him, “I do hope INEC officials will conduct free, fair and credible elections in the country,” he said. Mother’s Day is here again, join millions of people all over the world in celebrating mothers this season with the KaymuSelfie With Mom campaign. Post pictures of you and your mum on instagram with hashtags #MyMotherMyHero, #KaymuNigeria and stand a chance to win a custom made designer dress for your mother by AYABA. 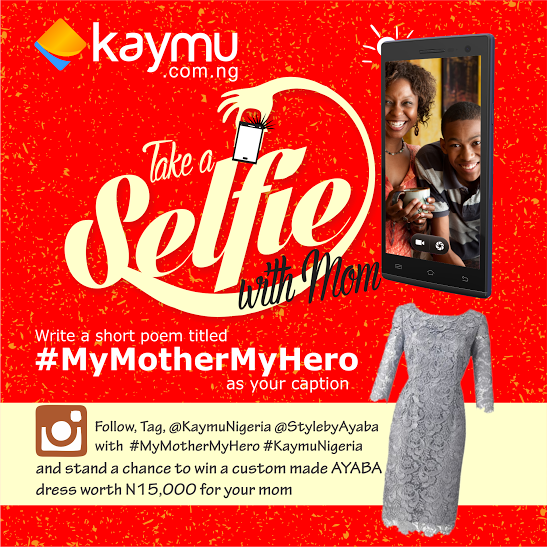 You can join the conversation by writing a short poem titled MyMotherMyHero as your caption, follow and tag @KaymuNigeria and @stylebyayaba on Instagram. The post with the most genuine likes will be declared winner on Monday 16th March, 2015. This campaign which kicked off on the 9th of March will end on the 15th of March, 2015, so hurry up and let’s celebrate our mothers. The wife of the governor of Anambra State, Chief (Mrs.) Ebelechukwu Obiano has called on women whose children have cleft lip and cleft palate deformities to come forward and take advantage of the free surgery her pet project, Caring Family Enhancement initiative (CAFÉ), is sponsoring at the Nnamdi Azikiwe University Teaching Hospital (NAUTH), Nnewi. The governor’s wife made the call when she visited the hospital on Monday to assess progress of the children under-going surgery for cleft palate deformities. The ship of Nigeria’s President Goodluck Jonathan has developed another embarrassing new leak after Morocco openly denied his claims and denounced his “unethical practices” as unbecoming, and recalled its ambassador. "HM the King has actually declined the request of the Nigerian government because it is part of the internal electioneering and this country's fundamentally hostile positions with regard to the territorial integrity of the Kingdom," it said in an unusually strong statement. 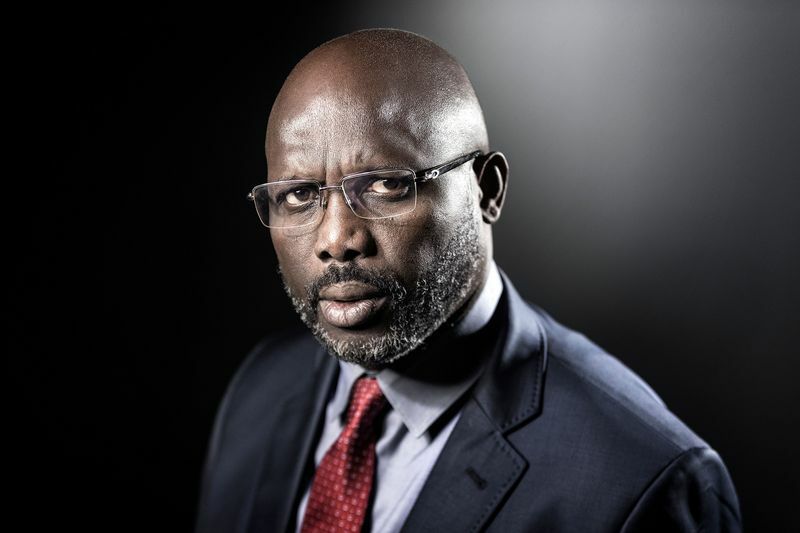 It rebuffed Jonathan’s posturing after the Nigerian leader appeared to have tried to obtain political mileage with Muslim voters ahead of this month’s presidential election by claiming he had had a phone conversation with King Mohammed VI. Last Sunday, the Nigerian government released a statement through the Ministry of Foreign Affairs in which it denied reports that the king had snubbed President Jonathan. The Catholic Bishop of Awka Diocese, His Lordship Most Rev. Paulinus Ezeokafor has Congratulated the executiveY governor of Anambra State, Chief Willie Obiano who will on Tuesday 17 March 2015 marks his one year in office even as he described the governor's 365 days stay as Anambra's helmsman as remarkable and eventful. Bishop Ezeokafor who stated this in an exclusive interview with Fides, at St. Patrick's Catholic Cathedral, Awka thanked God for the gift of Governor Obiano and also for instilling in him the zeal to work for the common good of the people as well as for making Anambra a safe haven for local and foreign investors. The Catholic prelate, while congratulating the governor, praised him for introducing a new bus mass transit scheme in Anambra noting that scheme if well managed would alleviate the suffering of commuters which he said oftentimes get themselves stucked in one transportation problems or the other. Musiliu Obanikoro Mr. Obanikoro’s confirmation had previously been held up on three occasions as up to 40 Senators rejected his candidacy over his involvement in the rigging of last year’s gubernatorial poll in Ekiti. A rigging meeting on the eve of the election featured some of the principal characters in the plot, including Obanikoro, and was secretly taped by an army captain and published by SaharaReporters. Today, a ruthless Mr. Mark, apparently working on a plan to railroad the confirmation process, mobilized People Democratic Party Senators to the chambers of the Senate for Mr. Obanikoro’s confirmation. Knowing that many of his colleagues, especially members of the All Progressives Congress, wanted to question the nominee, Mark merely asked the assembled Senators to vote on whether they wanted Mr. Obanikoro to “bow and go,” a strategy used as an informal blessing when Senators do not wish to question the president’s nominees. Many People were woken up Wednesday with the socking news of the sack of former Chairman of the Subsidy Reinvestment and Empowerment Programme, Gen. Martin Luther Agwai (rtd.) by President Goodluck Jonathan which is unconnected with the former visit to former President Olusegun Obasanjo's 78th birthday lecture. The President has named Mr. Ishaya Dare Akau as Agwai’s replacement. This was made public in statement signed by the Special Adviser to the president on Media and Publicity, Dr. Reuben Abati, attributed Agwai’s sack to the continuation of government’s efforts to continuously reposition Federal Government’s agencies for optimal delivery. Ashiwaju.org was rightly informed that the sudden sacking of the immediate past chairman of SURE-P was traceable to visit he made to the former president 78th birthday lecture, which had in attendance personalities not in the progressive record of the president and was then regarded as an act of saboteur and could not be allowed to reign in the president team. the resolution of government is that women and youths would receive the very best of social welfare packages . This was the standpoint of Chief Victor Umeh while responding to questions from journalists yesterday at rally in Awka .Chief Umeh stated that if elected as the senator representing Anambra-central senatorial zone in the impending national assembly elections , he would work closely with the State Governor Chief Willie Obiano to ensure that women and youths in Anambra State were given good welfare programmes and empowerment schemes . Cape Town International Jazz Festival 2015: Sweet Sixteen and Thriving! The Cape Town international Jazz Festival (CTIJF), Africa’s grandest gathering celebrates 16 years of success in 2015, with the announcement of further artists set to join the line-up for this year’s edition in Cape Town on 27 and 28 March 2015. Al Jarreau (USA); Andrea Motis and Joan Chamarro (SPAIN); Cannibal Ox (USA); Dee Dee Bridgewater and Irvin Mayfield with The New Orleans Jazz Orchestra (USA); Donald (SA); Gavin Minter Septet (SA); Heathfield High School Jazz Band (SA); Hugh Masekela and Oliver Mtukudzi (SA/ZIM); Jason Miles presents: To Grover With Love, ft Gerald Veasley with Marion Meadows and Elan Trotman (USA); Jitsenic (SA); Mike Del Ferro ft Tony Lakatos (NETHERLANDS/SA); Mike Perry's Tribute To Winston Mankunku (SA); Mr Cheeks (USA); Naima McLean (SA); Prophets Of Da City (SA); Ringo Madlingozi (SA); Pacific Express (SA); The City (SA); Thundercat (USA); Victor Masondo and Friends; A Journey Through Music Celebrating our Rich Heritage and Legacy, ft Thembi Mtshali (SA); Yvonne Chaka Chaka (SA). One of the leading satellite and terrestrial Television and Radio service provider, African Independent Television (AIT) owners was alleged to have received N10 billion to produce and air negative documentaries against the leaders of the All Progressives Congress (APC) Chief Bola Ahmed Tinubu. Ashiwaju.org learnt that the Nigeria Minister of Petroleum and Natural Resoueces, Mrs. Diezani Allison-Madueke is bankrolling the documentary while the scripts and voice overs are being prepared and cut with the help of the Nigeria Television Authority and some Nollywood production companies and working for President Jonathan's re-election. 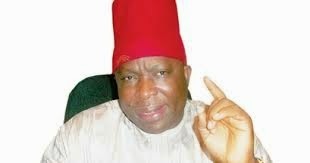 Chief (Sir) Victor Umeh, FNIVS, KSJI, OFR, is the National Chairman of All Progressives Grand Alliance (APGA) and Anambra Central senatorial candidate of his party. In this concluding interview with Fides editorial team comprising Jude Atupulazi (Editor-in-Chief); Uche Amunike (Asst. Editor) and Abuchi Onwumelu, he talks on several issues ranging from the allegations levelled against him by former special adviser to Gov. Willie Obiano on political Matters, Chief Joe Martins Uzodike through the stoning of Gov. Willie Obiano at Agulu, to his mission at the senate. The governorship candidate of the All Progressives Congress in Lagos State, Mr. Akinwunmi Ambode, has urged Lagosians not to be influenced by tribal and religious sentiments in the general elections. He said instead, the residents should vote for the party that would bring about good governance and betterment of their lives. Ambode added that the residents of the state should reject being influenced by the Greek gift of the Peoples Democratic Party in voting against their conscience. Ambode, who noted that the President and the leadership of the PDP had turned Lagos to their second home in the last few weeks in order to buy the conscience of Lagosians, said the PDP would fail woefully in the elections. In commemoration of the International Women’s day celebrated worldwide on the 8th of March, leading online marketplace kaymu.com.ng has put together an inspiring video of leading women in Kaymu to share how they “Make It Happen”, in line with this year’s theme. The Bishop told governor Obiano that the buses are already making great impact in the lives of Ndi Anambra by easing the burden of transportation in the state. He narrated the pleasant experience of one of the Seminarians in the Parish who travelled on one of the buses from Ekwulobia to Awka. According to the Bishop, “The Seminarian confirmed that he paid only N70.00 to travel the distance. The bus trip was relaxed with proper ventilation and music for the listening pleasure of the commuters.” Previously, bus trip on that route cost commuters N150.00. Bishop Ezeokafor praised the mass transit initiative, adding that he is looking forward to when he will park his car and travel in an air-conditioned bus to Awka. As he braces up to present his scorecard in the past one year to Ndi Anambra, Governor Willie Obiano must indeed be one happy man. He has driven himself and his team to unbearable limits in search of results and now, he has a Bounteous Harvest in his hands and a very rosy tomorrow beckons. Obiano’s contentment may not come from the usual satisfaction that a leader gets after giving his all in the service of his people. It comes from knowing that the people he has pushed himself beyond tolerance to serve in the past 365 days are indeed appreciative of his efforts. 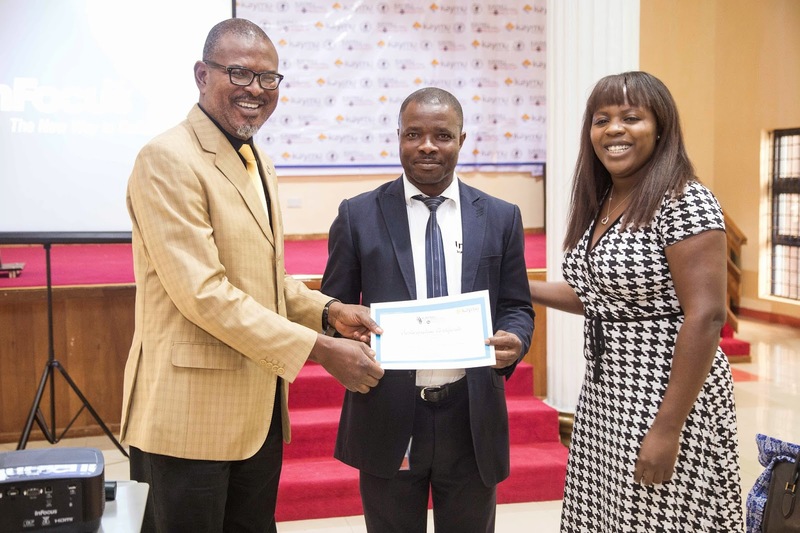 Once in every while, a cruel twist of fate could turn a hero to a villain in a situation similar to what the peerless poet, Christopher Okigbo might call the “error of the rendering.” But Obiano’s story is different. He has the support and approval of Ndi Anambra. The move to reduce hate speeches that beveled the nation’s political atmosphere and promote peaceful electoral cohesion ahead of the coming general elections, politicians in Anambra state have been advised to dwell more on issue based campaign and eschew name calling in their electioneering exercises. 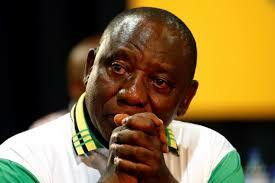 drive that would sell mainly their manifesto to the electorates without biased, stressed that electorates are more aware to cast their vote for candidates of their choice whom they know would provide them with favourable political platform. The member representing, Aniocha, Njikoja/Dunukofia Federal Constituency, Honourable Uche Ekwunife, gave the advice, when a delegation of Anambra Bloggers Chapel paid her a visit in Awka, stressed the need for politicians to ensure that the unity of the state and development of human resources should be the cardinal objective they ought to seek, rather than hitting up the polity with political speeches that is cable to foment disharmony in the society.